If reports are to go by, the upcoming 12.9-inch and 10.5-inch Apple iPad Pros are all set to go almost bezel-less. These iPad Pros will also be getting the Face ID feature and in all likelihood, will be ditching the 3.5mm headphone jack. The 2018 Apple iPad Pros might be getting some facelift if a report by Japanese site Macotakara is anything to go by. 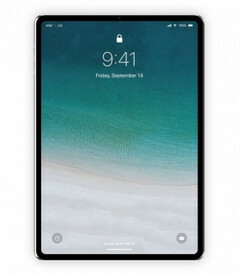 Both the 10.5 and 12.9-inches of the iPad Pro will be getting some bezel trimming making them resemble the edge-to-edge display of the iPhone X.
Macotakara quotes supplier sources who say that the 10.5-inch iPad Pro dimensions (H x W x T) will be reduced from 250.6 x 174.1 x 6.1 mm to 247.5 x 178.7 x 6 mm while the 12.9-inch iPad Pro will be getting a trim from 305.7 x 220.6 x 6.9 mm to 280 x 215 x 6.4 mm. Additionally, there will be two microphones at the top and the reduced dimensions mean that the 3.5 mm headphone jack will be ditched for a Lightning-to-3.5 mm adapter. However, it is doubtful whether such an adapter will be provided with the package. The new iPad Pros will also come with support for Apple's Face ID tech but it requires using the device in portrait mode, which is sort of cumbersome. The Smart Connector is also slated to move to the 'lower rear side' near the Lightning connector. Also being confirmed is that the the next iPhone's 6.1-inch LCD model will adopt the 'Full Active' display made by Japan Display. The display will sport narrow bezels on all four sides but will require a high precision to manufacture. Suppliers seem to say that they are currently having only a '1% completion rate' when they starting manufacturing these displays in July and that they can only be shipped by November 2018 at the latest. The new iPad Pros are expected to be unveiled this September alongside a host of new refreshes including the new iPhones, MacBook, iMac, Mac Mini, a larger Apple Watch, and new AirPods.